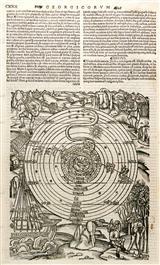 Description: Early woodcut plan of the Ptolemaic model of the Solar System with Earth at its centre. It is bordered by charming rural scenes and a fine ship. Description: Early miniature celestial hemispheres map. Decorative scrollwork. Coloured. 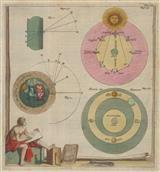 Description: Double-hemisphere celestial map based on Blaeu. The smaller charts compare the classical geo-centric and modern helio-centric models of the solar system. Original colour. 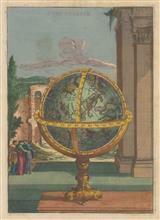 Description: An image of a celestial globe on a decorative base. Dutch F. Halma edition. Vivid original hand colour. Description: An image of a terrestrial globe. Dutch F. Halma edition. Vivid original hand colour. Description: Diagram showing methods for the observation of stars. Original hand colour. 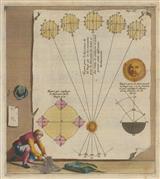 Description: Four diagrams on one sheet explaining the theory of eclipses and the movement of the earth around the sun. Original hand colour. Description: Several diagrams on one sheet explaining the theory behind sextant readings and sundials. Original hand colour. 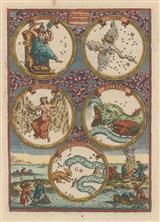 Description: A series of diagrams showing the revolution of the earth and explaining the concept of night and day. Original hand colour. 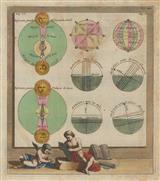 Description: A series of diagrams explaining the theory of eclipses and of the earth's tilt. Original hand colour. Description: One large diagram showing the earth's orbit around the sun with an inset of a map of the Eastern Hemisphere. Original hand colour. Description: Several diagrams on one sheet explaining the orbit of the planets in the solar system, the orbit of the moon around the earth and diagrams of the constellations of the Great Bear and the Little Bear. Original hand colour. Description: Glorious celestial comparative chart illustrating the relative magnitudes of stars and planets including the sun, moon and Earth. Valk and Schenk edition. Original hand colour.